As of Friday, I am in this brand new black cast. Unfortunately, a black and yellow/gold cast was not an option. I will now wear this cast until early March, and then the doctor will remove the two pins currently in my wrist. (I've included the complete medical information below if you're truly interested in the specifics about the procedure.) I'll start physical therapy two days after getting the pins out, but it will still be some time until my wrist is back to normal. 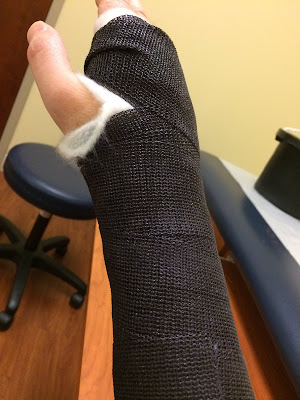 I'm sure that you're all concerned about the status of this blog while I'm on the DL (and my wrist too!). I can still type with one hand, so I plan on continuing to write. However, I'm looking for people who are interested in writing a guest blog post. I'm also hoping to have some interviews since it's much easier to type a few questions and let the responses be the centerpiece of the post. If you're interested in writing a guest post or know someone who would be available for an interview about an interesting topic, please let me know. Pre and Post-Operative Diagnosis: Volar dislocation, distal ulna, right wrist. Procedure: Closed reduction and percutaneous pinning of closed volar dislocation, distal ulna, right wrist. Ugh. That sounds pretty painful. Hoping you're not in too much pain and that you heal quickly. That sounds -- and looks -- painful. So sorry you're going through all this. Hope you make a quick and full recovery! Thanks Emily and Melissa! Really, the only time I have discomfort is trying to get comfortable going to sleep. I mentioned this in a separate post, but it's the little things that I can't do (tying my shoes, opening containers) that is frustrating along with the big issue in that I really can't pick up my five month old. Each day is one closer to getting the cast off and starting physical therapy.